1. Lower impact on body: Water is denser than air and the buoyancy of water reduced the pressure impact on the body. This allows to do stretching, toning, cardio, strength building and other healthy workouts without putting stress and strain on the bones, joints, tissues and ligaments. This results in fewer injuries and sprains. 2. Time and duration: Thanks to the reduced stress and strain, now people are able to exercise for a longer period of time than they would be able to do on land. This also allows them to take on more difficult forms of exercises with tougher intervals alongside shortening the recovery time between exercises. get the scope to do the workout without the issues with deep water running. 4. More calorie burned: Due to the resistance and added density of water, a session of workout done in water leads to more calories burned compared to the same exercise done on land. For example, 30 minutes jogging on land burns around 200 calories whereas the same effort in aqua-jogging will burn an extra 150 calories, which in total is 350 calories and almost equals to double of land jogging. 5. Space convenience: Doing workouts and various forms of exercises on land requires more space, running and jogging. That’s not the case for deep water running. As long as the depth is good enough not to touch the bottom with the feet, it’s all good to go. Deep water running and other forms of aqua-based exercises do not require much space. The most common and prominent spot for doing this is the swimming pool. 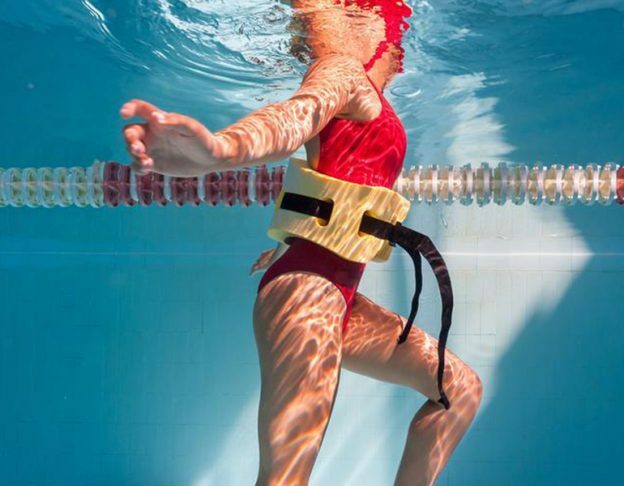 With all these benefits, deep water running is an excellent choice for doing workouts in a fun way without having to deal with joint or back pain or any other strain. It provides the opportunity to do more with less while having a group to cheer-up and support during this fun activity. Deep water running is highly recommended for everyone, so without having double thoughts, go out there and plunge in.